Discover the artistic and architectural treasures of Florence on a private, 3-hour tour led by local art historian guide. Learn the fascinating history behind the birthplace of the Renaissance as you explore highlights like the Duomo complex, Piazza della Signoria and the Ponte Vecchio, and see one of the world's most famous works of art up close with a viewing of Michelangelo's ‘David’ at the Academia Gallery. Price is per group, based on a maximum of 15 adults. Admission fees not included. A walk through Florence’s winding, well-preserved streets is like stepping back in time to the height of the Renaissance. Get an insider’s perspective on the fascinating city and its treasures with a private, 3-hour tour. Choose from a morning, afternoon or evening tour and meet your art historian guide in the Piazza della Repubblica, the historic, open-air gathering place that’s home to many important statues and buildings. Explore the city's spiritual center on a tour of the magnificent Duomo complex, including the beautiful green-and-white marble baptistery, Giotto’s Bell Tower and the Santa Maria dei Fiori Cathedral, crowned by Brunelleschi’s famous dome (entrance fees not included). Next, head to the Academia Gallery to admire one of the world's most iconic artworks — Michelangelo’s larger-than-life ‘David’ statue. Learn about the history of the piece and how it was relocated here from Piazza della Signoria in 1873. See Michelangelo's ‘Prisoners’ series and other statues and paintings representing the very best of the Renaissance. 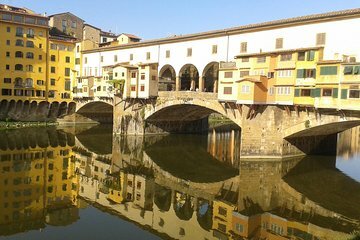 Depending on the pace and preferences of you private group, continue on to see other Florentine highlights including Piazza della Ufizzi and the famed Ponte Vecchio bridge. Throughout the tour, ask all the questions you like and enjoy the expertise and personalized attention of your private guide. Please note: Museum and attraction entrance tickets are not included in the tour price. Your guide will pre-book reservation for you to avoid the long lines, and you will collect and pay for your tickets before entry.